Clockwork Cleaners offers dry cleaning pick-up services to our valued clients. Once you set it up with us, the service is completely automated. 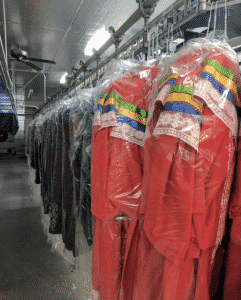 For dry cleaning pick-up and delivery services in Orange County, Clockwork Cleaners stands head and shoulders above other dry cleaning services. Experience service and quality that is without peer or parallel. Clockwork Cleaners sets itself apart from the competition on a daily basis by practicing eco-friendly standards and charging one low price per garment. $2.75 across the board will get most of your garments the VIP treatment (with the exception of wedding gowns and other formal wear, leather, suede, and other items that require special care and consideration). Try our dry cleaning pick-up service once and you’ll never go back to the conventional dry cleaning experience. Clockwork Cleaners offers reduced rates to those who need their dry cleaning done in bulk. We offer our same concierge-style dry cleaning pick-up and delivery services to our valued customers, whether they be corporate accounts or walk-ins experiencing the Clockwork Cleaners treatment for the first time. by the close of business. Opt in for our dry cleaning pick-up and delivery service and you never have to leave your house for fresh and clean clothes again. Contact Clockwork Cleaners today to learn more about our flat rate style of dry cleaning and our commitment to service that sets new standards for pick-up dry cleaning in Orange County. We look forward to seeing you here the next time you need to give your garments the VIP treatment. Same Day Service Cut-off Time is 9AM. We serve the city of Orange, CA, while providing dry cleaning services to the surrounding communities of Newport Beach, Laguna Beach, Tustin, and all of Orange County.